HandCash to see what it is all about. I am very impressed with the professionalism, quality and speed of this Bitcoin Wallet. In this interview, Alex is nice enough to answer my questions in Q: / A: format about holding cryptocurrency on your cell phone. Readers will find our conversation full of product details and I learned a great deal about HandCash and their future prospects. Overall this makes me very optimistic about Bitcoin SV (BSV) and HandCash in general. 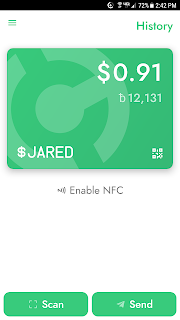 Jared: Where did you come up with the idea for HandCash? Blockchain (i.e. Blockchain Technology i.e. The Blockchain) is a computer network that works by being shared freely among and used by many participants. The idea behind blockchain is that there are times when it is beneficial to have a permanent record of transactions. Those transactions can be the purchasing of property, the sale of goods or services, or the exchange of currencies. In its simplest form, a blockchain is just a list of transactions using a medium of exchange. In its initial implementation, that medium was a "coin" called a Bitcoin. Subsequently, many other coins were created and those coins are all used in their own blockchain. As of December 22, 2018, CoinMarketCap lists 2067 coins/tokens (https://coinmarketcap.com/all/views/all/). On the most basic level, they are all mediums of exchange for transactions that are put on a list. This list is called a ledger and this is intuitive as transactions are frequently economic. Bitcoin ABC or Bitcoin SV? This article was written by Greg Wyche. This does not represent the opinion of Jared Schlar. I recently had to opportunity to speak with TracySpacy, Founder of Memopay, a new and very unique advertising network built on a the Bitcoin Cash blockchain. 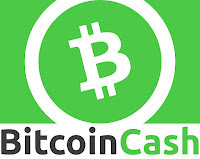 This project is a service which allows business to send messages and run ad campaigns targeted directly to BCH users. Intrigued? Read on to learn more about how this could be a game-changer for driving BCH adoption in the long term and for disrupting the way businesses run ads and communicate with their customers. Jared: How did you come up with the idea for memopay? Please provide a bit of background about yourself and your team (if applicable). TracySpacy: Memopay initially started as an extension to the memo.cash social network. It allows people to send funds to any BCH address outside of the memo.cash network (which was not possible before). I recently had the opportunity to interview Kim “Randy” Jinyrul, a developer based in South Korea who you may be hearing quite a bit about in the the near future. Randy is quickly making a name for himself in the Bitcoin Cash community with the Beta version of the new QaRT Wallet, a new app that fundamentally changes the way QR codes are used, and increase BCH adoption in the process. QR codes are an incredible innovation. The idea of encoding information and making it quickly and easily scannable goes back decades, to the invention of RFID and barcodes. But just like these older technologies, QR codes have a problem: only a machine capable of scanning and deciphering the code can make any sense of what it means. If you were to look at a QR code right now, would you be able to tell what information it contains without some sort of contextual information or additional explanation? Of course not. If you've had the opportunity to visit Coin Dance's development page, there’s a lot of creative energy evident. Several concepts are under discussion, six are classified as under development and five are completed. In an effort to raise awareness of the diligent efforts of our fellow BCH enthusiasts, this is the first of a series of articles on development projects relating to either the BCH source code or the manner in which BCH is processed by financial software. In this article, I will highlight four proposed upgrades to the BCH ecosystem in various stages of development. In a later article, I will discuss two additional development proposals in progress, as well as interview some BCH developers about the challenges they face as innovators in this burgeoning and impactful blockchain space. Finally, in a third article, I will describe the 5 development projects described as complete on Coin Dance.